Escape the city traffic and crowds and board a luxury Nile River restaurants cruising the world longest waterway. Experience the top class service aboard this cruising restaurant, admiring Cairo's gladden skyline while you get your dinner meal, with entertainment available with amazing belly dancing and folklore show. Select from the set menu or go for the a la carte option offering seafood, Lebanese & Chinese cuisines. Sit back and rest while you watch a colorful belly dancing show with a folklore squad, admire the memorable Tannoura spin, in respect with Egypt's whirling dervishes’ heritage. 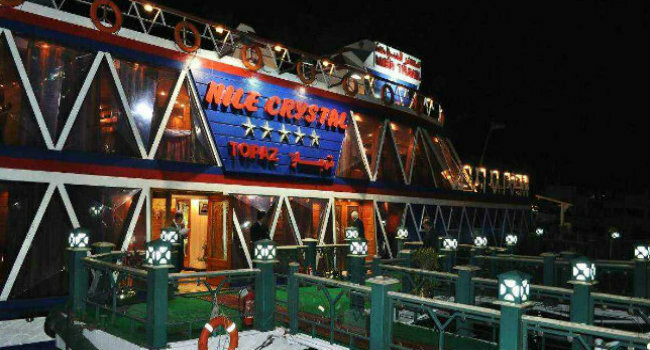 The dinner cruise trip is one of the top things to do for travelers to Cairo, it allows you an insight of Cairo waterfront landmarks and historical architecture away from this busy city. We pick you up from your Cairo hotel with private return transfer and assistant guide to guarantee the best dinning opportunity.